1. Partner for financial reasons. Although it may seem basic, many businesses still ignore this rule when entering partnerships. They might enter a partnership for the purpose of gaining publicity, or they could have simply let flattery cloud their judgment. In any case, partnerships should be based on the fundamental principles of business and should aim to increase revenue and cash flow while decreasing costs. They could do so by trading clients or customers, exchanging supplier information, adjusting inventory procedures, or collaborating on marketing campaigns, but in all cases, your bottom line should be positively impacted. If the numbers won’t change, the partnership probably isn’t worth your time or effort. 2. Partner for strengths, not weaknesses. A crucial characteristic of successful partnerships is that they are established to emphasize each party’s strengths, not conceal their weaknesses. If you recognize that your business has serious flaws, you cannot simply ignore them, and you need to recognize that entering a partnership is usually not a solution. These defects need to be addressed and corrected, not obscured by a partnership deal. Your partnership’s motto should be “Help us to do better that which we already do well,” not “Help us to conceal our shortcomings.” Establishing a successful partnership requires you to honestly address your goals and evaluate your business, and if your motto is more clearly reflected by the latter example, realize that it’s probably time to revise your business strategy. 3. Reach a smart agreement. First and foremost, establish both parties’ goals for the partnership. Detail what each party is expected to deliver and the details and measurements of that delivery. This seems basic, but it can prevent destructive disagreements from arising over misunderstood responsibilities. Also, remember to include a termination clause in your partnership agreement, one that gives your company ample time (usually 30-60 days’ notice) to readjust to doing business without a partnership. Without this “out clause,” many partnerships fail before they even become official. The out clause is important because it gives both parties peace of mind knowing that, in the event that the agreement turns sour or fails to be mutually beneficial, either one can terminate the partnership with little hassle. This not only makes the initial step towards entering the partnership much more enticing, but a seemingly “risk free” partnership also allows both parties to remain innovative and original. Like a healthy marriage, an effective partnership should be difficult to walk away from because of the benefits it provides to both parties, not because of complicated paperwork. Lawyers are sometimes necessary to help finalize the partnership agreement, but they should do just that – finalize it. Make sure you consult your lawyers only after you have agreed on the majority of the terms of the partnership. This is because lawyers, in general, seek to expose flaws in business agreements that could prevent them from being carried out. In his book The Art of the Start, Guy Kawasaki describes lawyers as follows: “Many lawyers view their role as ‘adult supervision’ that will prevent stupid deals from taking place. However, their bias is often that a deal is bad until proven good.” This type of lawyer could cause so much doubt between parties that your partnership is never established, so be sure to choose a service-provider lawyer, not a watchdog lawyer. Also, remember that despite the doubts your lawyer may present about your partnership, he is ultimately nothing more than a consultant. Nobody knows your business like you do. Partnerships have the ability to greatly improve the businesses of both parties, but they must be established for the right reasons. 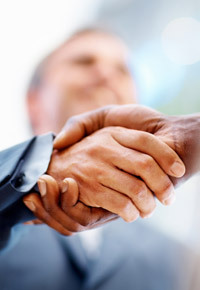 You must also handle every step of the partnership process with great care. With these tips, though, you have the potential to create a mutually rewarding and successful partnership. I tink dat this article was very intreseting and It help me get an A on my project by plagerizing it so Thanks.